Last Updated: 18 July 2013. Tsunami, a Japanese word meaning "harbor wave", is a wave in the ocean or lake created by a geological event. The term tsunami was adopted for general use in 1963 by an international scientific conference. Oceanographers call tsunami-seismic sea-waves. This is because tsunami is usually caused by earthquakes, land sliders or marine sliders under or near the ocean. Volcanic eruptions can also cause tsunamis. A tsunami is not a single wave, but a series of waves that can travel across the ocean at speeds of more than 500 miles an hour. For those on shore there is little warning of a tsunami's approach. December 26, 2004, the day after Christmas, the world woke to starting news! A massive earthquake measuring 8.9 on the Richter scale had occurred near the Sumatra Island. Huge waves called tsunamis, travelling at 500-750 miles per hour were gulping everything on the way. The 8-minute quake had actually ripped apart the sea floor. Billions of tones sea water flowed away from the fault in a series of giant waves. Thirty minutes after the shaking had subsided the first wave, travelling eastwards, crashed into Sumatra. The city of Banda Acech was almost completely destroyed and tens of thousands of people were killed in just 15 minutes. The countries worst affected were Sri Lanka, Indonesia, Southern parts of India, Thailand, Philippines, Malaysia and the Maldives. Leaving a devastated Sumatra behind, the series of waves continued across the Andaman Sea towards Thailand. A herd of elephants in the mountain seemed to know it was coming. They began behaving strangely, stamping the ground and tugging at their chains, eventually breaking away to run to the hills. Elephants have special bones in their feet that enable them to sense seismic vibrations before we can. The trough, reaching the shore of Thailand, cause the sea to disappear if the beaches. It is one of the classic warning signs of an approaching tsunami. The devastating tidal waves that lashed several coastal districts of Tamil Nadu, India left at least 8000 dead and rendered many people homeless. More than 500 people died in Cuddalore alone. Let us hope in God this will not occur again. This calls for better meteorology in all parts of the world. By Senthil / In Chennai. Tsunami is an ocean wave caused by an underwater earth quake. 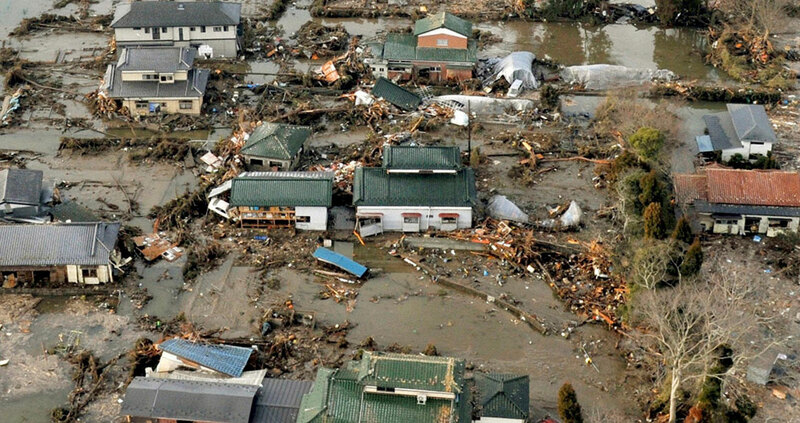 The term "Tsunami" comes from the Japanese language meaning harbour (tsu) and wave (nami). Tsunamis are popularly called tidal waves, although they are not related to tidal movements. Tsunamis are said to be the result of vertical movements of the ocean floor that are caused by strong earthquakes. Such earthquakes commonly occur at depths of less than 30 km beneath the ocean floor. Tsunami have tremendous energy because of the great volume of water that is affected. They travel very rapidly sometimes reaching 800 km per hour. When a tsunami reaches swallow waters along a shore a tremendous wave builds up and rushes inland.